A hip labral tear is an injury to the labrum, the cartilage that surrounds the outside rim of your hip joint socket. The hip joint is a ball and socket joint in which the head of the femur is the ball and the pelvic acetabulum forms the socket. The labrum helps to deepen the socket and provide stability to the joint. It also acts as a cushion and enables smooth movements of the joint. A tear in the labrum of the hip can result from traumatic injury, such as a motor vehicle accident or from participating in sports such as football, soccer, basketball, and snow skiing. These sports are associated with sudden changes of direction and twisting movements that can cause pain in the hip. Repetitive movements and weight bearing activities over time can lead to joint wear and tear that can ultimately result in a hip labral tear. Degenerative changes to the hip joint in older patients can also lead to a labral tear. 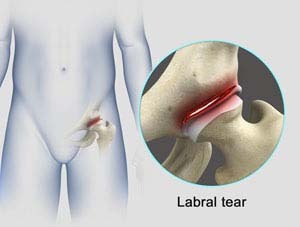 Many patients with a hip labral tear do not have symptoms. However, some patients may experience pain in the hip or groin area, a catching or locking sensation in the hip joint, or significant restriction in hip movement. Treatmentfor ahip labral tearwill vary dependingon the severityof the condition. People with a minor labral tear recover within a few weeks with the help of non-surgical treatments. Medications:Anti-inflammatory medications can be helpful in relieving pain and reducing inflammation associated with labral tears. Your doctor may also recommend cortisone injections to alleviate the pain associated with a hip labral tear. Physical therapy: Physical therapy that helps to improve hip range of motion, strength, and stability are also recommended.